One of the limitations of I2C, on which Qwiic is based, is that some sensors only have one or two changeable bits in their address. Some even have a single fixed address. 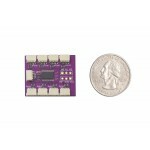 That means that you can’t use more than one of them connected to the same I2C bus on your microcontroller. What if you want to use more than one? 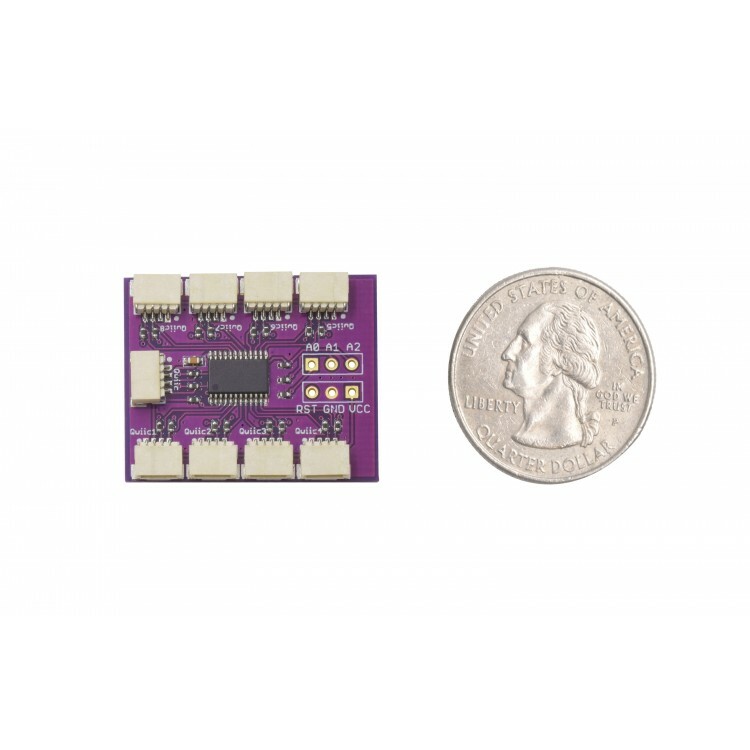 Thanks to the handy-dandy Zio Qwiic MUX, you can use up to EIGHT of that fixed-address TOF range-finder module that you want to stick on every side of your drone for automatic collision avoidance. 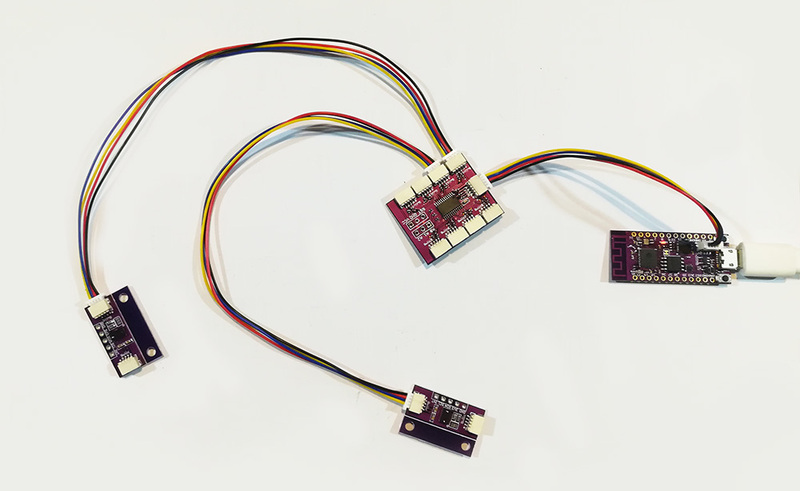 Your shattered dreams of building an I2C-based motion capture suit using BNO080 breakouts? Shattered no more, my friend. We’ve got your sixteen sensors right here. What’s the trick? 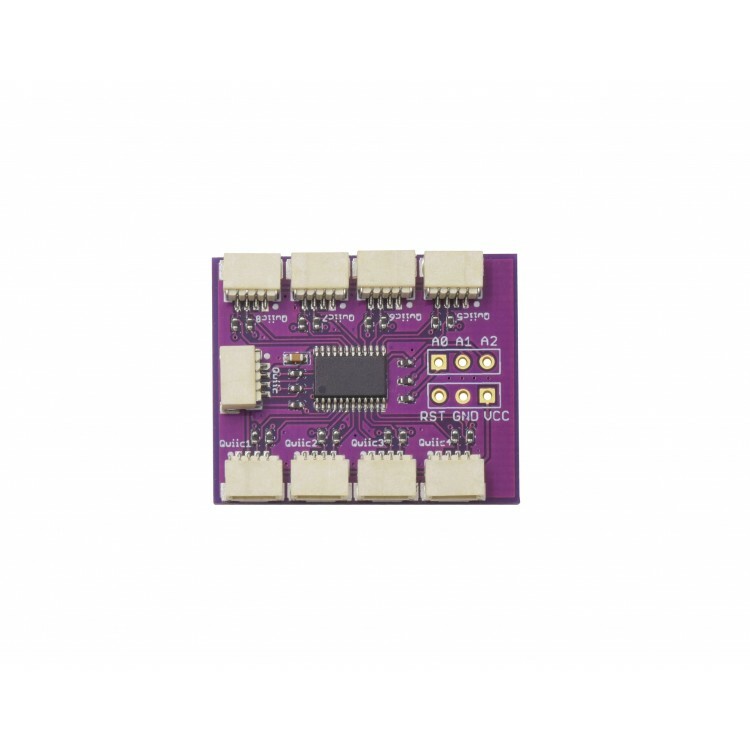 The TCA9548APWR is an eight-channel two-wire bus multiplexer. It is, in fact, an I2C device itself. By changing the value of one of the TCA9548APWR’s registers, you can route the connection from your MCU to any of eight pairs of pins, each with their own set of pullup resistors (optional, via solder jumpers), on the other side of this IC. It’s a lot like a railroad track switch. Want to know what else is cool about that? It overcomes the 4-foot wire-length limitation of Qwiic. Each one of those ports counts as a different bus. We don’t do any voltage level shifting on these ports. Each and every one is an unadulterated 3.3v Qwiic port. The TCA9548APWR also has three configurable address bits, so you can use up to eight of them on the same bus. 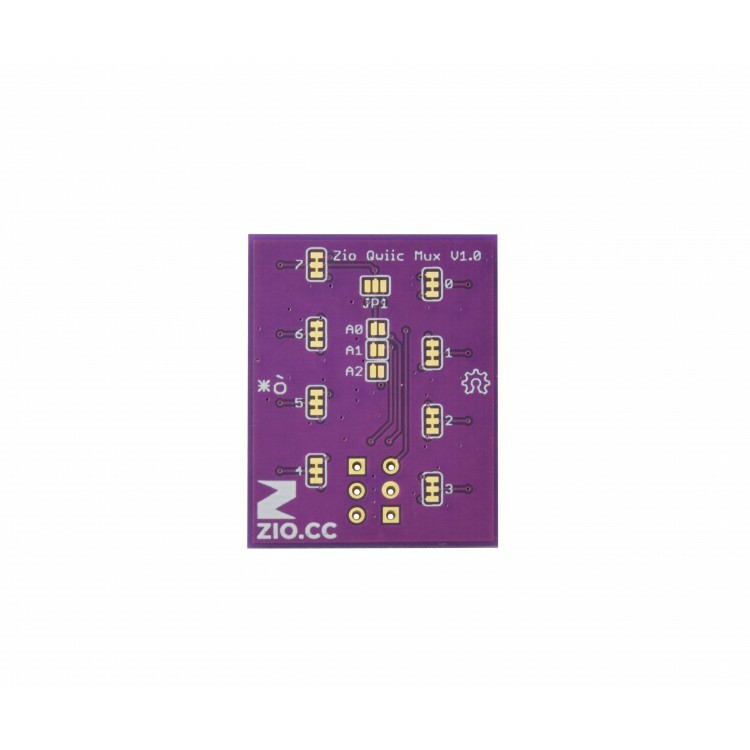 Or you can get really crazy and connect eight other Zio Qwiic MUX boards, all with the same address, to each of the eight ports on your first Zio Qwiic MUX. And then… well, exponents being what they are, you could split your one I2C bus into over sixteen million of them using only these boards. That is, if you had the money and space and inclination. Frankly speaking, we don’t recommend it. But if you want to place an order for the two million or so boards necessary to do it, we could probably work out some kind of volume discount for you. Just don’t ask us to offer a power supply solution for that. 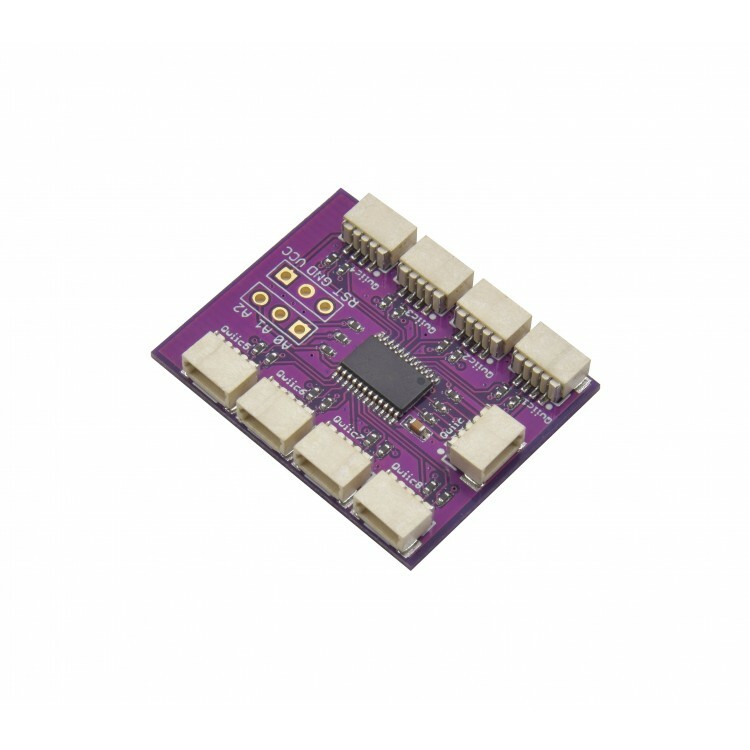 This Zio Qwiic Mux will allow you to use up to 8 fixed-address sensor modules AND overcome the 4ft wire-length limit on Qwiic. Each port is a different bus.